1) Voluntary skeletal muscle is under conscious control. Each fibre is an enormous, multi-nucleate cell, formed by fusing hundreds of myoblasts end-to-end. They show a striated pattern, reflecting the regular arrangement of sarcomeres within each cell. 2) Cardiac muscle is similar to skeletal muscle, but is not under conscious control. These mono-nucleate cells are much smaller, but still show a striated pattern. 3) Smooth muscle is closer to non-muscle cells. No regular striations are visible and the contractions are much slower. Smooth muscle is found in the blood vessels, gut, skin, eye pupils, urinary and reproductive tracts. Type 1 or slow oxidative fibres have a slow contraction speed and a low myosin ATPase activity. These cells are specialised for steady, continuous activity and are highly resistant to fatigue. Their motor neurones are often active, with a low firing frequency. These cells are thin (high surface to volume ratio) with a good capillary supply for efficient gas exchange. They are rich in mitochondria and myoglobin which gives them a red colour. They are built for aerobic metabolism and prefer to use fat as a source of energy. These are the marathon runner's muscle fibres. Type 2A or fast oxidative-glycolytic fibres have a fast contraction speed and a high myosin ATPase activity. They are progressively recruited when additional effort is required, but are still very resistant to fatigue. Their motor neurones show bursts of intermittent activity. These cells are thin (high surface to volume ratio) with a good capillary supply for efficient gas exchange. They are rich in mitochondria and myoglobin which gives them a red colour. They are built for aerobic metabolism and can use either glucose or fats as a source of energy. These are general purpose muscle fibres which give the edge in athletic performance, but they are more expensive to operate than type 1. Type 2B or fast glycolytic fibres have a fast contraction speed and a high myosin ATPase activity. They are only recruited for brief maximal efforts and are easily fatigued. Their motor neurones transmit occasional bursts of very high frequency impulses. These are large cells with a poor surface to volume ratio and their limited capillary supply slows the delivery of oxygen and removal of waste products. They have few mitochondria and little myoglobin, resulting in a white colour (e.g. chicken breast). They generate ATP by the anaerobic fermentation of glucose to lactic acid. These are sprinter's muscle fibres, no use for sustained performance. These differences are nicely illustrated by the serial sections from rat diaphragm published by Gauthier and Lowey (1979) J. Cell Biology 81, 10-25. In the figure above, the left hand section was stained for the mitochondrial enzyme succinate dehydrogenase, the centre panel shows direct immunofluorescence against "fast" type myosin, and the right hand section was stained for alkali-stable ATPase activity (i.e. "fast" type myosin). Notice the differences in the fibre diameters, which correlates with their requirements for efficient gas and substrate exchange. Notice also how the mitochondria tend to cluster near the outside of the cells. Voluntary muscle cells are electrically isolated from each other, and respond only to direct instructions from a particular motor neurone via the motor end plate. They have nicotinic acetylcholine receptors, which are ligand-gated sodium channels concentrated in a specialised region of the muscle sarcolemma beneath the axon terminus. These ion channels respond to acetylcholine (secreted from the nerve) by depolarising the muscle sarcolemma near the motor end plate. The depolarisation triggers voltage-gated sodium channels which spread the excitation over the remainder of the cell. In cardiac muscle and some types of smooth muscle the cells are in electrical contact through communicating gap junctions. These are important for the orderly spread of excitation through the heart. This starts with the spontaneous depolarisation of the specialised pacemaker cells in the sino-atrial node, spreads via the atria to the atrio-ventricular node and thence to the conducting fibres in the Bundle of His (in the intraventricular septum) and the Purkinje system. These cells finally activate the bulk of the ventricular muscle in the chamber walls, in each case through direct electrical contacts. Catecholamine hormones such as adrenalin are released during frightening or stressful situations. They increase the force and frequency of cardiac contractions by binding to Beta-1 receptors, which are protein molecules protruding from the outer face of the cardiac sarcolemma. These activate G-proteins within the membrane, which in turn activate the enzyme adenyl cyclase on the inner face of the sarcolemma. Adenyl cyclase produces 3'5' cyclic AMP, which is an important second messenger controlling numerous intra-cellular activities. Cyclic AMP activates protein kinase A which phosphorylates many intracellular enzymes, temporarily modifying their properties. Cardiac muscle contains muscarinic acetylcholine receptors. These are also linked to adenyl cyclase (via inhibitory G proteins) and to a potassium ion channel in the cardiac sarcolemma. Acetylcholine reduces the levels of cyclic AMP and increases potassium currents, promoting slower, less forceful beats. Many types of smooth muscle also contain gap junctions and muscarinic acetylcholine receptors, but here acetylcholine normally leads to contraction. Depending on the type of smooth muscle, catecholamines may produce either contraction (alpha receptors linked to intracellular calcium stores), or relaxation (beta receptors linked to adenyl cyclase). This relaxation is apparently mediated by the cyclic AMP-dependent phosphorylation and inactivation of the enzyme myosin light chain kinase, which plays a central role in smooth muscle contraction. Vascular smooth muscle redistributes the blood supply during exercise, and visceral smooth muscle empties the gut in stressful or frightening situations. In contrast to all this, the force of contraction in voluntary muscle is unaffected by circulating hormones. The diagram above shows the control of cardiac muscle contraction in greater detail. The Na/K ATPase or sodium pump (1) works continuously, using the energy from ATP to maintain a high K+ concentration inside the cells and a high Na+ concentration in the extracellular fluid (ECF). The cell membrane (sarcolemma) is usually more permeable to potassium ions than to sodium ions, and this gives rise to a membrane potential of about 80mV (inside negative) in relaxed muscle. Calcium ions are also removed from the cytosol into the ECF by an ATP-driven calcium pump (2) in all tissues. Cardiac muscle possesses an additional sodium/calcium exchange protein (3). This export system is driven by the pre-existing sodium ion gradient. The calcium concentration inside resting cells is low, but rises sharply during contractions. The sarcolemma is very thin (about 6 nm) so the 80mV membrane potential equates to a voltage gradient of about 13,000,000 volts per metre! All membrane components are subject to intense electric fields, and protein conformations are greatly influenced by the membrane potential. "Voltage gated" ion channels will only conduct over a narrow range of membrane potentials, whereas "ligand gated" ion channels (such as the acetylcholine receptor in voluntary muscle) require specific chemical activators. Contraction in cardiac muscle is triggered by a wave of membrane depolarisation which spreads from neighbouring cells. The change in electric field activates voltage gated sodium channels (4) in the sarcolemma, each of which allows a few hundred positively charged sodium ions to enter the negatively charged cytosol, further reducing the cardiac membrane potential until the whole sarcolemma is depolarised. The sodium channel undergoes a second conformational change, as a result of which these channels close spontaneously after a few milliseconds in all excitable tissues. In cardiac muscle, but NOT skeletal muscle, slower voltage-gated calcium channels, probably identical with dihydropyridine receptors (5) take over and maintain a positive inward current for several hundred milliseconds (in human ventricle) during the plateau phase of the cardiac action potential. As in nerves and skeletal muscle, the membrane potential in cardiac muscle is eventually restored to its resting value by a delayed efflux of positive potassium ions from the cells. Dihydropyridine drugs (e.g. verapamil & nifedipine) inhibit calcium entry into heart and reduce blood pressure. About 10% of the calcium needed to activate cardiac contraction enters during each beat from the ECF. This is often described as "trigger calcium". The remainder is released from the sarcoplasmic reticulum through a channel known as the ryanodine receptor (6). Ryanodine receptors are widely distributed in the body, and are present in non-muscle tissues such as brain. The genes coding for this enormous protein (5037 amino acids) have been sequenced. Different tissues have their own specific isoenzymes. The operation of the ryanodine receptor depends in a mysterious way on the flow of calcium ions through the dihydropyridine receptors in cardiac muscle, but not in other muscle types. Calcium ions from both sources bind to the regulatory protein troponin-C located in the thin filaments (7), leading to a change in filament shape. This allows flexible head groups from the protein myosin in the thick filaments (8) to interact with the protein actin in the thin filaments. A change in myosin conformation causes the thick and thin filaments to slide against each other and hydrolyse ATP, which provides the energy for contraction. Movement and ATP hydrolysis continue until the calcium ions are removed from the cytosol at the end of each contraction. Most of the calcium ions are returned to the sarcoplasmic reticulum by a calcium pump (9) but about 10% leave the cell via proteins (2) and (3) described above. Calcium ions are stored within the sarcoplasmic reticulum loosely bound to a protein, calsequestrin (10). In cardiac muscle circulating hormones like catecholamines and glucagon bind to specific receptors (11) on the outer surface of the sarcolemma, changing their shape. This change is communicated via G-proteins (12) within the sarcolemma to adenyl cyclase (13) bound to the internal face of the sarcolemma. Several G-proteins are known, some activatory, others inhibitory. They all slowly hydrolyse GTP while working, although it is not clear what advantage this confers on the cell. Adenyl cyclase manufactures 3'5' cyclic AMP, which is continuously destroyed by a phosphodiesterase enzyme. The steady-state concentration of cyclic AMP depends on the balance between synthesis and degradation. Cyclic AMP in turn controls the activity of cyclic AMP-dependent protein kinase. This enzyme phosphorylates several of the proteins involved in the contraction process, and temporarily alters their properties until a protein phosphatase restores the status quo ante by removing the phosphate group. The sodium pump (1) is activated by phosphorylation, which allows it to handle the increased ion traffic across the sarcolemma when cardiac work output rises. The enzymes triglyceride lipase (14) and glycogen phosphorylase (15) are activated by phosphorylation. These enzymes catalyse the first steps in the mobilisation of food reserves. They eventually increase the supply of ATP and provide the energy for the anticipated extra work. These changes take place in a coordinated sequence over many seconds, so that the initial response to adrenalin may be a pounding heart, but both the rate and the force of contraction tend to return to normal when the stimulation is prolonged. Skeletal muscle can contract in the absence of extracellular calcium, and skeletal S.R, shows depolarisation-induced calcium release In contrast to this, cardiac S.R needs external "trigger calcium" to enter the cells via the dihydropyridine receptors during the plateau phase of each action potential to initiate calcium-induced calcium release (CICR). Cardiac and skeletal ryanodine receptors probably differ in their precise intracellular location. The two genes are on separate chromosomes and show substantial differences. They are also expressed in brain, egg cells and many other tissues, where they regulate calcium release from the smooth endoplasmic reticulum. Dihydropyridine receptors are also present in some smooth muscles. They are blocked by the important drugs verapamil and nifedipine, which reduce the force of cardiac contraction, while maintaining an adequate cardiac output by relaxing vascular smooth muscle and reducing the peripheral vascular resistance. The system(s) which terminate CICR are far from clear, There must be some mechanism, since otherwise rising cytosolic calcium would lock the S.R. Ca++ release channels in the open state. Perhaps the ryanodine receptor has a built in relaxation time (like the voltage gated sodium channels in the sarcolemma) or perhaps there is a mechanism to sense the emptying of the S.R. The transmembrane protein triadin might provide a link to either measure or modulate calcium binding to the low-affinity binding protein calsequestrin in the lumen of the S.R. The repeated entry of external calcium ions during the plateau phase of each cardiac action potential requires a cardio-specific calcium export system to stabilise the internal calcium concentration. This is achieved by the electrical exchange of one intracellular Ca++ ion for three extracellular Na+ ions in cardiac muscle. The exchange is assisted by the resting membrane potential. Cardiac glycosides such as ouabain and digitalis (from foxgloves) inhibit the Na/K ATPase, reducing the Na+ gradient across the plasmalemma in all tissues. This specifically increases the force of cardiac (but not skeletal muscle) contraction by interfering with the cardiac Ca++ export system. Smooth muscles form a very heterogenous group of tissues, and the properties of vascular smooth muscles differ greatly from those in the airway, gut or reproductive tract. Many of these differences arise from tissue-specific expression of cell surface receptors, but even among the intracellular proteins, the variation between different smooth muscles is at least as great as that between the different types of striated muscle. Smooth muscle has only about half the myosin found in striated muscles, and lacks their sarcomere organisation [actin:myosin = 7:1 in striated muscle, 15:1 in smooth muscle, very large ratio in non-muscle cells]. Smooth muscle myosins do not self-associate into the thick filaments seen in striated muscles. Smooth muscle contraction speeds are very slow when compared with voluntary muscle, but it can achieve a much greater degree of shortening, and it is very economical to operate. In contrast to the "all or none" reactions associated with nerves and striated muscles, smooth muscles often show a graded response to membrane depolarisation. Cell to cell transmission via communicating gap junctions may be very important in smooth muscles, as in the heart. The resting potential in smooth muscles is generally lower than in striated muscles, and fast voltage-gated sodium channels are not significant. Chloride ion circulation (electroneutral uptake of NaCl plus electrical export of chloride ions) may be important in setting the resting potential in the 40mV range. Spike depolarisations associated with calcium ion entry are seen in some types of smooth muscle, but the fast action potentials associated with nerves and striated muscles are not observed. Receptors are distributed fairly evenly over the surface of smooth muscle cells, and are not organised in synapses or motor end plates seen in nerves and voluntary muscles. Many types of smooth muscle require external calcium in order to contract, and have nifedipine-sensitive calcium channels very similar to the dihydropyridine receptors observed in cardiac muscle. Troponin is absent from smooth muscles, and their actin regulatory system (where present) differs considerably from the thin filament regulatory system found in striated muscles. Caldesmon is a smooth muscle protein that binds reversibly to the actin / tropomyosin filaments and blocks the actomyosin ATPase activity. Caldesmon can be sequestered away from the actin by two separate, calcium-dependent methods: (a) by phosphorylation using protein kinase C, or (b) by binding calcium and calmodulin to form a caldesmon-calcium-calmodulin complex that is unable to bind to actin. In contrast to this, troponin is a permanent feature of striated muscle thin filaments, and never dissociates from the actin. 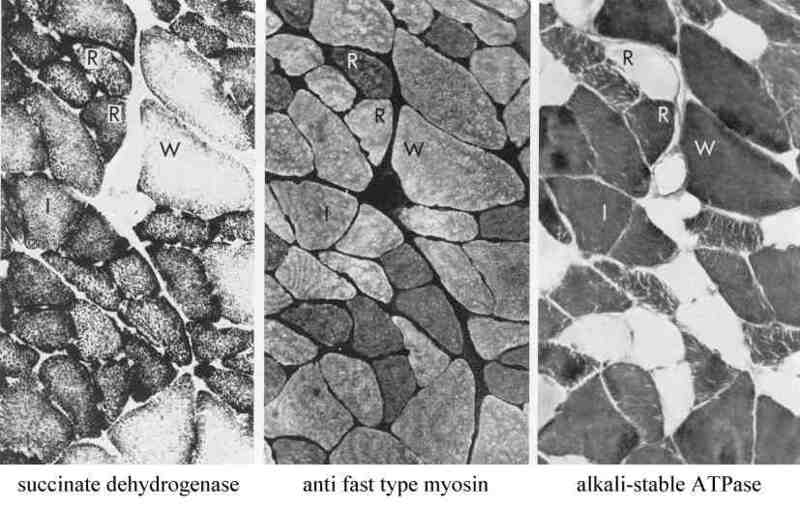 The myosin regulatory system is much more important in smooth muscles than in striated muscle. The enzyme myosin light chain kinase is activated by calcium + calmodulin, and phosphorylates the DTNB "regulatory" light chains in the myosin S1 head groups. This increases the inherent myosin calcium sensitivity, and brings it into the physiological range, allowing contraction to proceed. This system also operates in striated muscle, where it seems to play a subordinate role. Phosphorylation of myosin light chains on a second site by protein kinase C interferes with this process and leads to smooth muscle relaxation. Isolated vascular smooth muscle contracts in response to acetyl choline, but this compound relaxes intact blood vessels as a result of nitric oxide generated by endothelial cells. Nitric oxide relaxes vascular smooth muscle via cyclic GMP. Both vascular and airway smooth muscles relax in response to beta adrenergic agonists via cyclic AMP. These effects are of considerable medical significance in the treatment of hypertension and asthma. Gene knockout experiments [Pfeifer et al (1998)] have established that cAMP and cGMP transduce independent signalling pathways, but the detailed mechanisms underlying these effects remain to be elucidated. Muscle tissue accounts for most of an individual's mass and daily energy consumption. Fuel economy is very important, not only for minimising food requirements, but also for reducing unwanted heat production. The different skeletal muscle fibre types are described above: in general the routine tasks are handled by slowly contracting, economical fibres with an fat-based aerobic metabolism, and the more expensive high-speed fibres using carbohydrate fuels are only recruited when the occasion demands. Smooth muscle is particularly economical because it has a low myosin: actin ratio, a low ATPase activity and a much lower contraction speed. It is ideal for sphincters and slow squeezes, and is used for these tasks in preference to striated fibres. Cardiac muscle contracts quite slowly, but it is used continuously and the total energy consumption is high. It is totally specialised for energy production, and achieves the highest sustained metabolic rates (and the highest arterio-venous oxygen extractions) of any tissue in the body. Mitochondria represent 30-40% of the ventricular mass. This high metabolic rate creates serious diffusion problems within cardiac muscle. There is a high capillary density and the cells are small, with a high surface to volume ratio. The tissue is rich in myoglobin (for oxygen transport) and creatine + creatine phosphate (for energy transport). The organ shows a distinct preference for free fatty acids, ketone bodies and lactate; but requires insulin for efficient glucose uptake and utilisation. The myokinase equilibrium means that [AMP] = [ADP]*[ADP]/[ATP] (approximately). The free cytosolic ADP concentration is normally very low, because it is actively taken up by mitochondria in exchange for ATP. This makes 5' AMP an exquisitely sensitive indicator of the cellular energy supply in all types of muscle, and indeed in all other tissues. Linear 5' AMP is an activator for AMP-activated protein kinase [AMPK] which stimulates glucose uptake by skeletal muscle during exercise and under conditions of metabolic stress. It appears to play a major role in type 2 diabetes. Try not to confuse AMPK with protein kinase A (which responds to 3'5' cyclic AMP) since their functions are entirely different. AMPK protects cells from stresses that cause ATP depletion by switching off ATP-consuming biosynthetic pathways, whereas PKA is part of the hormonal second messenger system. The purine nucleotide cycle is an unusual feature of skeletal muscle, which serves to replenish TCA cycle and glycolytic intermediates when the energy demand is high. AMP is deaminated to yield inosine monophosphate (IMP) which is converted to adenylosuccinate and then back to AMP. The net effect is an AMP-dependent conversion of aspartate to fumarate and ammonia whenever the mechanical work load increases. The process can be used repeatedly because the aspartate pool is many times larger than the pool of TCA intermediates and is constantly replenished from the blood or the internal muscle protein stores. Skeletal muscle is the body's major store of amino acids during fasting. These tissues are degraded in an orderly fashion, and release mainly alanine and glutamine into the blood. These amino acids help to maintain blood glucose during fasting through gluconeogenesis in liver, kidney and gut. Skeletal muscles lack a urea cycle, but they are able to transaminate most amino acids and degrade their carbon skeletons as far as Krebs cycle intermediates, such as succinyl-CoA and fumarate. Surplus cycle intermediates are converted via an allosteric NAD-linked "malic" enzyme into pyruvate, which is transaminated to yield alanine. Some amino acids such as serine are deaminated to pyruvate and ammonia, which is de-toxified yielding glutamine. In this way surplus nitrogen is exported from the muscles to the liver, kidney and gut for further processing. in about 50% of cases; other mutations in fast sodium and L-type calcium channels. There is very much more information on the OMIM database. Please do not attempt to learn all the information in this table! It has been included to show the complexity of the systems controlling gene expression in muscle tissues, and to provide a quick method for locating reviews and original papers on particular aspects of muscle biochemistry. Use OMIM to identify one or two important papers in your area of interest, and then use the citation search option in BIDS to see who has subsequently quoted them. Major component of the thin filaments. Actin is an important cytoskeletal protein in non-muscle cells. Six human isoforms are known. Anchors some actin filaments to the sarcolemma (resembles spectrin in red cells). Defective or absent in muscular dystrophies. Utrophin is similar. Elastic element, links thick filaments to Z-lines. Titin is the largest protein in the human genome.